The AV3000HT is a high performance positive pressure facemask, manufactured using innovative materials which have been engineered to provide enhanced thermal durability and improved wearer safety in the most extreme conditions. The face seal utilizes proven SureSeal technology for maximum comfort, the dual seal provides a secure fit, the Kevlar head harness eliminates discomfort under helmets and the large visor provides excellent vision. Dual speech diaphragms offer enhanced voice transmission around the wearer, with optional right or left Epic Communications bracket for maximum versatility. 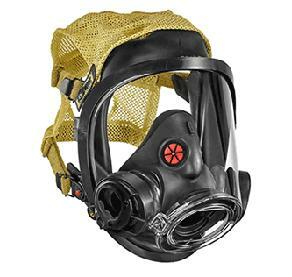 8005242 AV3000HT S AV3000HT positive pressure facemask featuring large visor providing excellent vision. Proven SureSeal technology face seal for maximum comfort. Front fitting for EZ-Flo demand valve. Small, 5 Point Kevlar head harness. CE marked to EN136. 8005243 AV3000HT M AV3000HT positive pressure facemask featuring large visor providing excellent vision. Proven SureSeal technology face seal for maximum comfort. Front fitting for EZ-Flo demand valve. Medium, 5 Point Kevlar head harness. CE marked to EN136. 8005244 AV3000HT L AV3000HT positive pressure facemask featuring large visor providing excellent vision. Proven SureSeal technology face seal for maximum comfort. Front fitting for EZ-Flo demand valve. Large, 5 Point Kevlar head harness. CE marked to EN136.